Back in 2012, I had a hunch to take my audio recorder and visit Cabela’s and REI, two outdoor sporting goods stores. I thought that the two businesses do a good job highlighting the divide in America. On the one hand you have REI: individualistic, urbane, and environmentally conscious. Liberal. 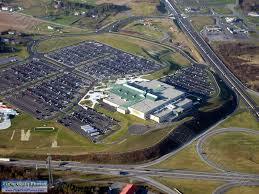 On the other hand you have Cabela’s: large, sells guns, family-oriented. Conservative. Both companies idealize nature and believe in conservation. REI thinks of nature as a place you go to have an exhilarating, extraordinary experience- just make sure to ‘leave no trace’. Cabela’s thinks of nature as a place to go hunting and fishing- and, continuing the tradition of conservation started by Theodore Roosevelt, believes that nature is best preserved by hunters paying their hunting license fees. Both businesses had giant, fiberglass mountains inside. REI’s was a rock-climbing wall. 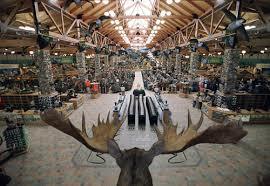 Cabela’s was covered with taxidermied animals. Both, in their way, represent human kind’s will to overcome and dominate nature. Fresh, black top, parking lot. Huge. Section A, B, C… you know the rest. Section for RV, for trucks. There’s a horse corall. A “pet exercise area”. A woman plays fetch with her dog. A Cross, across the way: the Appalachian mountains. and once you’re up there, what’s there? Nothing but disease, trees, threat, danger. Better to stay here in the car and drive over there. But I think there’s more guns in Cabela’s. than a mere town, greater than democracy. It’s even rivalling the mountains with its presence. Wherever you fall on that divide, I love you. This entry was posted on March 3, 2016, 6:02 pm and is filed under Sporting goods stores. You can follow any responses to this entry through RSS 2.0. You can leave a response, or trackback from your own site.